The National Thoroughbred Racing Association (NTRA) and Treasure Island Las Vegas announced today that the $1.5 million Daily Racing Form/NTRA National Handicapping Championship (NHC) Presented by Sovereign Stable would return to the popular Las Vegas property January 24-26, 2014 for the event’s 15th annual renewal. It will mark the first time that the NHC has been conducted over three days. The NHC had been a two-day tournament during its first 14 years. 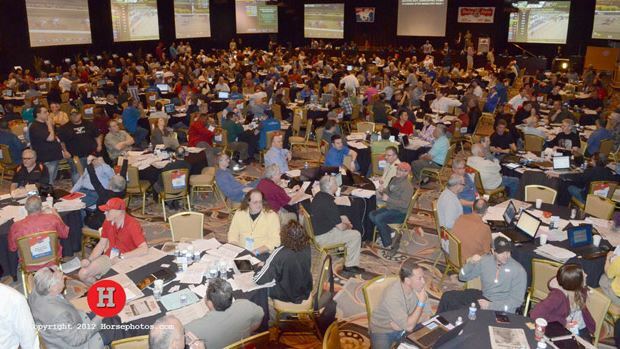 In advance of the NHC, Treasure Island will host its popular Wager to Win contests offering cash prizes and NHC qualifying berths to top finishers. These Wager to Win tournaments have been set for Sunday, April 7; Sunday, May 5; and Sunday, June 9. The April 7 event will carry a $500 entry fee and offer NHC seats to the top three finishing NHC Tour members. All entry fees will be returned to players in the form of cash prizes. For more details on the Wager to Win tournaments, contact the Treasure Island casino marketing department at 1-800-944-3777. The complete contest format and rules for the 15th NHC will be announced later this week. Treasure Island on the Las Vegas Strip is a privately owned hotel and casino boasting nearly 3,000 guest rooms and stands alone as the only major Strip property to claim that unique market position. It’s a world-class destination for headline entertainment, the enchanting Sirens of TI nightly outdoor show and Mystère, the classic Cirque du Soleil performance that combines the powerful athleticism, high-energy acrobatics and inspiring imagery that have become the company’s hallmark. Upscale and casual dining choices, hip nightspots and indulgent spa and shopping experiences further complement the one-of-a-kind Treasure Island guest experience. For information visit www.treasureisland.com, https://www.facebook.com/TIvegas or follow the property on Twitter @TIVegas. In its 15th year, the Daily Racing Form/NTRA National Handicapping Championship is the most important tournament of the year for horseplayers. There are no “buy-in” entries at the NHC. It is the culmination of a year-long series of NTRA-sanctioned local tournaments conducted by racetracks, casino racebooks, off-track betting facilities and horse racing and handicapping websites, each of which sends its top qualifiers to the national finals. Each year, the NHC winner joins other human and equine champions as an honoree at the Eclipse Awards. The 14 NHC Champions since the event’s inception, in chronological order, are Steven Walker, Judy Wagner, Herman Miller, Steve Wolfson Jr., Kent Meyer, Jamie Michelson, Ron Rippey, Stanley Bavlish, Richard Goodall, John Conte, Brian Troop, John Doyle, Michael Beychok and Jim Benes.